The House of Lanvin, founded by Jeanne Lanvin in 1889, the oldest Parisian fashion house, produces elegant jewelery as a complement to its clothing collections. In the late 1960s, Lanvin produced a series of carved plastic pendants on chains in the style of pop art, and today they are very popular. Traditionally, the brand “Lanvin” is synonymous with something amazing, gorgeous, original and unsurpassed! For more than a century, the unique Lanvin brand has produced a huge number of costume jewellery renowned throughout the world for its elegance, uniqueness and richness. The quality and sophisticated taste of this manufacturer will not leave anyone indifferent. Very extraordinary, bright, unusual and large, Elzac Jewelry is a rarity in the market of vintage jewelry. 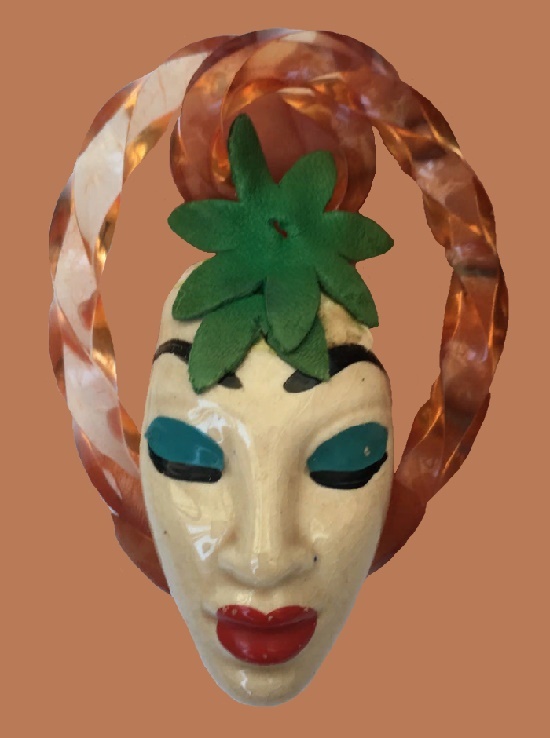 Headquartered in Los Angeles, this company used innovative materials such as ceramic, lucite, fur, feathers, cloth, and wood in unusual, whimsical ways. Eliot and Ruth Handler, alongside with their partner Zachary Zemby founded their company Elzac (Eliot + Zachary) in 1940. The demand for costume jewelry was high, and it was an ideal time for for such an innovative jewelry designs. Noteworthy, Eliot jewelers constructed and finished their decorations entirely by hand. Already in 1941 their products achieved great success and popularity over the next several years. It was during this period when more conventional jewelry materials were in short supply. Meanwhile, in 1943 the company launched the “Black Magic” line with beautiful decorations made from black plexiglas. Unfortunately, the popularity of Elzac’s style of jewelry waned rapidly after the war, and the company stopped production in 1947. 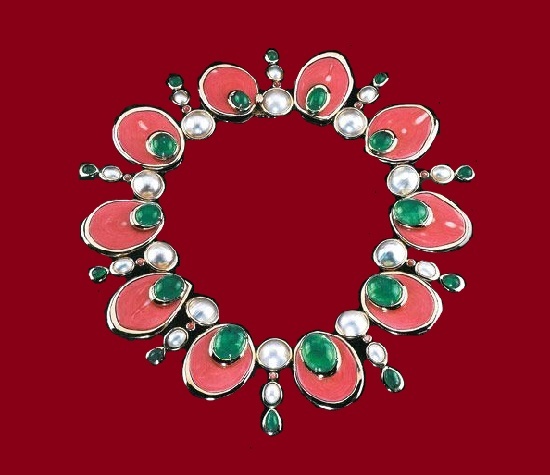 American jewelry company Silson Inc. of New York produced costume jewellery for a short period – a little more than ten years. Founded in 1937 by two brothers Victor and Jack Silberfeld, British citizens, who later changed their name to Silson. The main designer was Victor Silson whose name we meet most frequently. However, among other designers who worked for Silson were Samuel Rubin and George Stangl. 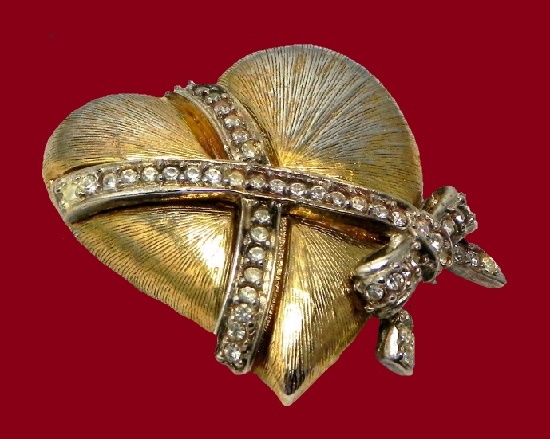 Three more jewelry designers – Howard Chandler Christy, Sue Harrison and Sally Stark also worked for the company. 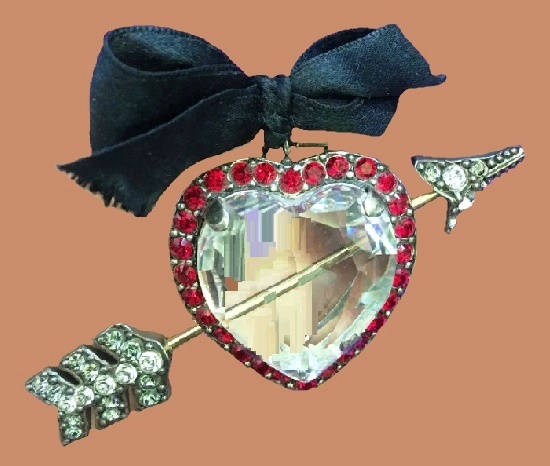 Traditionally, Silson jewelery includes gold-plated metal, enameled brooches, lucite and rhinestones clips and earrings with various motifs and designs. Noteworthy, Silson became famous for their line of patriotic and military jewelry produced during the WWII. In particular, brooches depicting American Eagle, Flag, Air Forces, British and American Ambulance Corps, or The Young Women’s Christian Association. According to various sources, Silson Inc. of New York ceased to exist in the late 1940s. 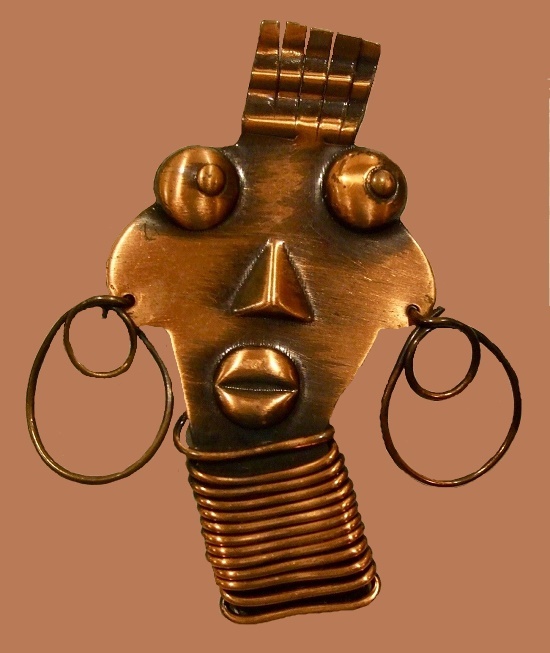 This is an inspired by African motifs original copper brooch with the image of an exotic Ubangi girl. The designer of his own jewellery line, Francisco Rebajes drew inspiration from the symbolism of ethnic masks and surrealism. 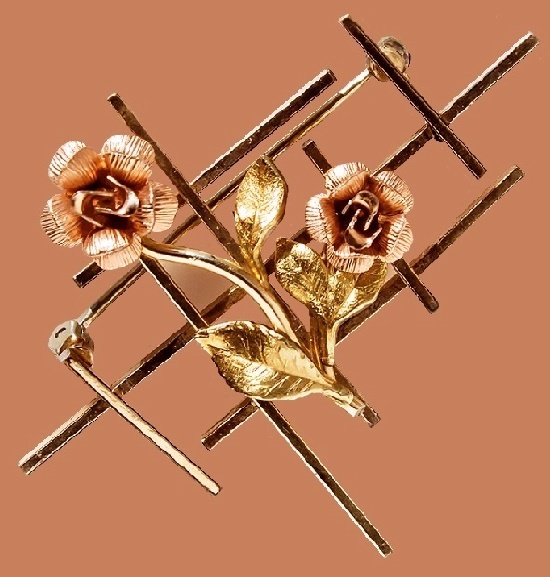 In fact, creating his handmade copper decorations he followed the artistic principles of modernism: flexible fluid lines and stylized floral motifs. Born in Spain in 1906, the future jewelry designer 16 year-old Francisco Rebajes moved to New York City in 1922. Like all emigrants, he took on any job. In 1932, he married Pauline Schwartz, against the wishes of her parents. Paulina and Frank began living in their friends’ apartment, where Frank set up a small workshop. The first collection of figures that Rebajes made from cans impressed the director of the Whitney Museum, Julian Fors, who bought it. This was the beginning of the great master’s journey. In 1934 he opened a studio shop in New York City. Frank’s career reached its peak in the 1950s, when he had a store on Fifth Avenue. There he sold jewelry and art objects until 1967. However, by the 1960s he stopped making jewellery and focused on sculpture. 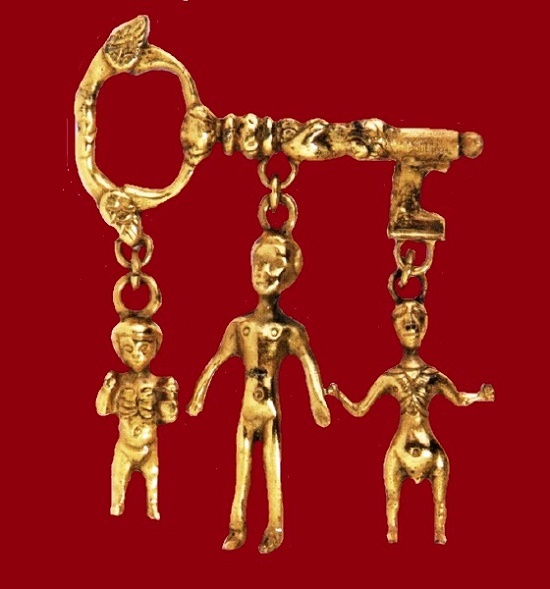 After returning to Spain, he made jewelry until his death in 1990.